The importance of health promotion in the workplace is increasingly being recognised, not only to prevent disease, disability or death caused by hazards at work and the working environment, but also because the workplace provides a setting and the opportunity to tackle health issues and improve the health of employees (Schilling, 1989; Health Education Authority, 1992 a,b,c; Trent Regional Health Authority, 1993). National policies such as The Health of the Nation, ‘Health at Work in the NHS’ and Health and Safety legislation endorse and encourage workplace health initiatives. Several national human resource initiatives such as ‘Investors in People’ contribute to a coordinated planned approach and can enhance health promotion initiatives. Health promotion interventions in the workplace are becoming increasingly common, particularly in larger organisations. The increase in activity has evolved due to a variety of factors: recognition of the costs of employee ill-health; response to internal and external pressures to be seen as caring employers; and health and safety and European legislation. However, as will be discussed in this chapter, the UK lags behind other countries in both the extent of provision of programmes and in evaluating such programmes. 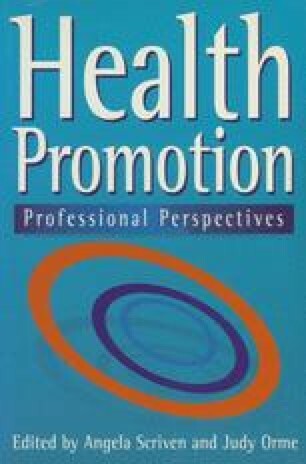 Therefore, drawing conclusions about the benefits of health promotion in the workplace, and making recommendations as to effective programmes, is limited.